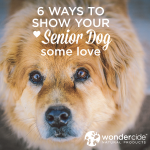 Senior dog health is a popular subject because our pets need extra care as they age. 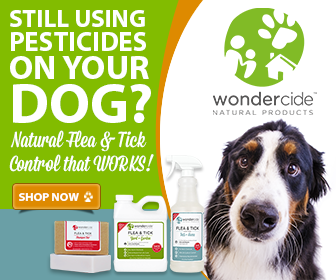 Wondercide was founded after our CEO Stephanie’s dog Luna became deathly ill at age 10 from using fipronil-based flea & tick “spot drops.” Once Stephanie nursed Luna back to health and converted her to a more holistic lifestyle, Luna lived for another six-and-a-half years without the burden of harsh chemicals in her daily routine. Many Wondercide customers have asked us what regimen Stephanie used for Luna from the time she was ten until her sweet sixteen, hoping to gain some insight and inspiration for their own holistic pet care endeavors. 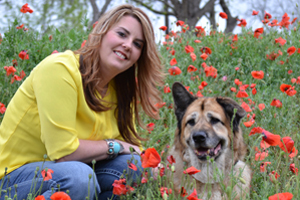 We chatted with Stephanie about Luna’s “senior dog health regimen,” and here’s what we found out! Vaccinations: From the time Luna was sick, I only ever gave her the 3-year rabies vaccination (because state and city require it) and sometimes even stretched that. She was never boarded or in an environment that would put her at risk from my perspective, so I was comfy doing that and only worked with vets that allowed me to make my own informed medical decisions for my fur babies. Heartworm Prevention: I never did traditional, pesticide-based heartworm pills, but rather protected the lawn and my pets religiously with Wondercide. I lived on the Gulf coast and in central Texas and never had an issue. 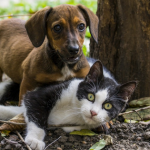 I recommend reading this post by Dr. Falconer to fully understand the details and decisions of going one way or another when it comes to heartworm prevention. Luna lived sixteen-and-a-half years, which is a miracle and atypical for her size and breed. Reasonable expectations should be set for breed and health history. Another piece of advice is to avoid sharing worried or intense feelings of concern around the animal. I believe they can sense the energy. When I would get that way while petting Luna, she would get up and walk away; she knew if I was worried about her. Instead, focus on positive thoughts and energy, joy and gratitude. Note: The routine outlined above represents Luna’s experiences and may not create the same results in all dogs. This information does not constitute medical advice; please consult a holistic veterinarian before making any adjustments to your senior dog health regimen. I saw your product on sharktank tonight. I am going to order this product as soon as I finish sending this message. Two years ago my first furry love, a beagle mixed dog named Buddy, died at the age of 12. He began stumbling and I thought he was just getting old. A year later his back legs became paralized, and three weeks later all four of his legs were paralyzed and he died. I believe his illness was caused by a very popular topical flea and tick medication. I have a second dog and I have been searching for a product like yours. I thank God for giving you the knowledge to develop this product. I wish I could hug your neck. THANK YOU!!!! So sorry about Buddy. We are glad you found us and are sending you a virtual hug right back! ? How is the product applied to your pets and how often? How long does a bottle last? DOGS | Rub coat in opposite direction and spray body, belly, legs & tail. Work through coat as close to skin as possible. Spray on to hands or cloth to apply to face and ears. Do not soak dogs. Safe for everyday use. CATS | 4 oz size recommended for best results. Test a small area on back of neck 8 hours prior to full body application. If no signs of sensitivity occur, lightly mist body, belly, legs & tail. Do not soak cats. HOME | Turn spray nozzle to fan. Hold spray applicator 12 inches above surface area and apply uniformly to all areas such as wood flooring, rugs, upholstery, furniture & pet bedding. Complete coverage is necessary to eliminate infestations. For carpeted areas, first vacuum, then spray or fog from 4-6 inches above floor. If problem persists, repeat both steps until resolved. Test fabrics before use. Hope that helps! Let us know if you have any further questions! I also followed you both on ST! My dog is large and swims every day so I am assuming I would have to use Wondercide frequently in one day. Cannot depend on husband to re-spray (man thing). Live in S Florida where fleas are a problem 24/7. I also have a senior cat that that is allergic to any chemicals and a flea infestation would be a disaster. She is indoors only. These chemicals for fleas and heart worm terrify me! Thanks for your question, Sandy! And we really appreciate you catching our episode of Shark Tank! Water will reduce the effectiveness of Wondercide, so if your dog is swimming once a day, we’d suggest applying before you go for your outing and one more time after he is dry. Flea & Tick Pets + Home can even be used for people, as it is the same formulation as our Insect Repellent, so your husband and dog can both stay protected from pests when they swim using the same spray. Perhaps that will help him remember to re-spray! The same product can also be used around your home to keep your cat protected! Hope that helps, but feel free to reach out to us at hello@wondercide.com if we can assist with anything further. Is wondercide pest control safe to use around budgies? I’m wondering if this can be used on horses? Thank you for your question! Our products can indeed be used on horses! Our Flea & Tick Control for Pets + Home, Skin Tonic, & Detox clay can all be used on horses. Additionally, our Outdoor Concentrate can be diluted down and used on horses as a flea & tick preventive. We would never recommend outdoor concentrate to be used on dogs or cats due to their sensitive pH balance, but for horses with their thick hide, the outdoor concentrate is great- and better value for money too. Let us know if you have any additional questions; we’re always glad to lend a paw.